Okay, as promised, I’m about to dive into the world of Income Reports! If you’re not familiar with the trend, it’s been popular over the last decade or so for bloggers to post income reports, showing how much money they make online & where it comes from. One of the most popular income reports is from Pat Flynn at Smart Passive Income, who has been documenting his online income since 2008. I also really really enjoy the Income Reports at Pinch of Yum. They go into great detail explaining how they make money off of their food blog, and help you understand exactly what they’ve tried, what worked, and what didn’t. The goal is not to gloat or brag, or show off how much money they are making, but rather to provide inspiration and value to other bloggers. To show them that is IS possible to make money online, and give them a road map to do it themselves. Just keep in mind, this January income is me ~2 1/2 years into becoming an RD. During my 1st year, I barely made any money (like $5,400 total) and was running around with no niche & no clear brand. For more info on my 1st year as an RD, check out this post. Long story short, at the end of that 1st year, I was feeling totally burnt out, unsuccessful, and a little dejected about starting a private practice. Thankfully, I had other sources of income at the time, so I just decided to take some time off from trying to start a practice, and figure out the type of work I truly enjoyed doing. 2016 was a year of self-discovery, starting fresh, & niching down. By mid 2016, I had trained to become a Certified LEAP Therapist, launched an entirely new website (www.ericajulson.com) & was ready to see clients again. The pay off of niching down & finding a focus was instantly clear. In the last 6 months of 2016, I made roughly $1,000 more than I earned in my entire first year as an RD (so I had roughly doubled my small monthly income by niching down). Happily, I can say things are growing and evolving in 2017 & I’m definitely on the path to creating a business I love & thrive in. In 2017, I’m really starting to take dietetic entrepreneurship more seriously, so January seems like the logical place to start my income reports. 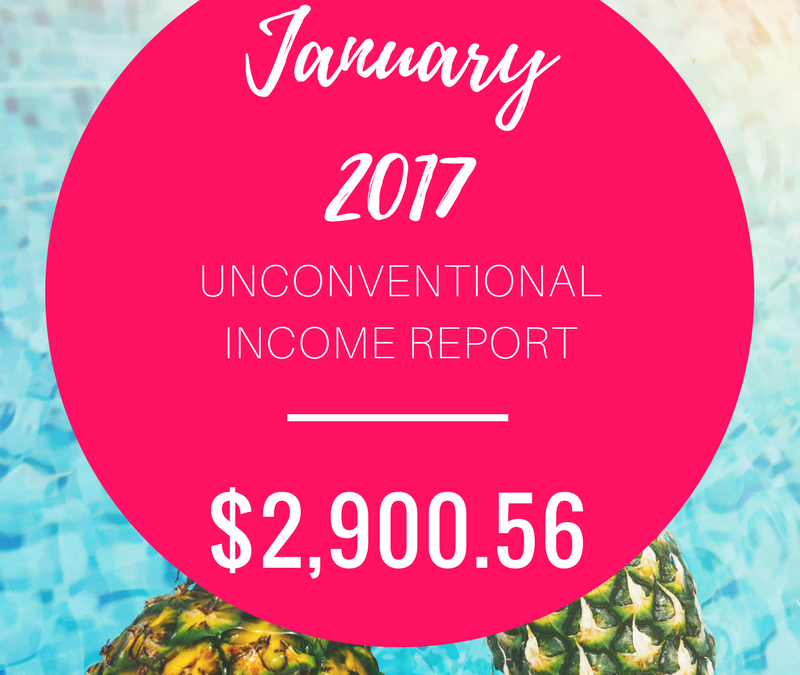 From here on out, I’ll be documenting my “unconventional” income & hopefully inspire you to think about new income sources for your own unconventional business! Keep in mind that I also still moonlight as a math and science tutor, and make slightly more from that each month than I do from my “unconventional” dietitian income. However my goal is to phase out any non-RD-related work within the next year, so I’m focusing extra hard on growing my unconventional income! What type of income will the reports cover? Ah, this is such a good question. Initially, I was grappling with whether or not to include income from 1:1 client work in my income reports. On the one hand, some aspects of running a private practice are very unconventional. For example, you have the freedom to set your own hours and area of expertise, to work from the comfort of your own home if you desire, and to gain experience and trust in your niche that can help you set the stage for passive income products down the road. But on the other hand, if you’re not careful and intentional about the type of work you’re doing, private practice can quickly become another self-created 9-5, where you’re stuck trading your time directly for money and are caught in the rat race of work-work-work. 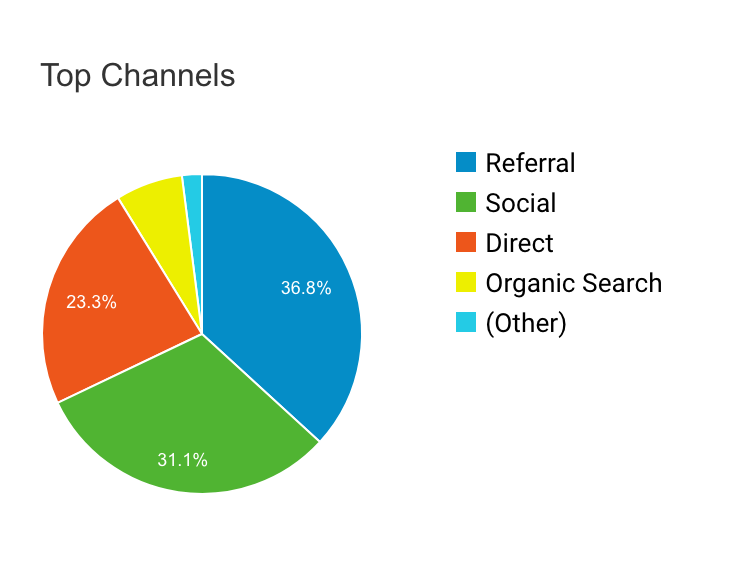 In the end, I decided to structure my income reports based on the categories Darren Rowse describes in his “Make Money Blogging” article. So from here on out, I’ll be documenting any nutrition-related income that falls into one of these 8 categories. So as you can see, I am still earning the majority of my income through 1:1 client work, BUT, I am starting to diversify my income streams and slowly grow them, so that over time, I can reduce the amount of 1:1 work I do. 1. Nutrition Counseling ($1,650) – I currently run a virtual private practice in which I see cash-pay clients via video chat or phone. I also offer email support to clients, where I answer questions/consult via email only. Now that my practice is clearly focused on helping people with food sensitivities, it is WAY less stressful and much more enjoyable to run. HOWEVER – I want to be super clear that running a private practice is not really my long term goal. In my ideal world, I will be teaching/writing/educating about nutrition online, and not really working with clients 1:1. Because of this, I plan to keep my client load capped at ~20 clients per month. This way, I’ll be able to see clients just a few days of the week, and keep my schedule open for writing, blogging, and building my passive income streams. In January 2017, I was actively working with 8 different clients, so slightly less than 50% of full-capacity. This was already a huge jump, because my monthly average in 2016 was only 4 clients! 2. Consulting $682.38 – Back in the fall of 2016, I was interested in adding some nutrition-related consulting work to my schedule, so I reached out to a few contacts to see if they had any extra work I may be able to assist with. Luckily for me, the 2016-2017 school year ended up being the year in which school districts had to revamp their Local School Wellness Policies to meet federal guidelines from the Healthy, Hunger-Free Kids Act of 2010. So, I was able to secure some freelance work helping to rewrite the policy for a nearby school district. Winning! Writing policies is something I consider myself good at, and I love that I could complete the work from home. Plus, I did a lot of resarch on the Healthy, Hunger-Free Kids Act back in graduate school and assisted in the auditing process during my internship, so the topic was something I am familiar with. 1. Selling tests without appointments ($225) – Although I STRONGLY encourage all of my clients to purchase nutrition-related testing with at least one appointment to go over the results, occassionally I will make exceptions and sell a test on its own with a small fee to account for my time spent facilitating the shipping & instructions for the test. 2. Supplement Sales ($55.80) – Whenever a client purchases a professional grade supplement through me, I earn a small commission on the sale. This month, I earned $55.80 in commission from clients purchasing supplements. I used to manually order the supplements for clients… but now I am enrolled with Fullscript.com, and I can’t believe I ever sold or recommended supplements any other way. Once you sign up for a Fullscript account, you can add client profiles, create custom online recommendations for them, and send recommendations via email directly to your client. The best part is that you can pass on part of your professional discount to clients, which allows them to save some money while also being assured that they are getting a quality product that has not been tampered with or adulterated (something that is questionable with third-party online retailers like Amazon). If/when one of your clients places an order, Fullscript automatically fulfills the order for them, sends the product directly to the client’s house, charges their card, and direct-deposits any sales income into your bank account. Winning! 1. Corporate Wellness ($225) – I occasionally do some independent contractor work for a corporate wellness company called Balance Integration. Whenever one of the local companies they are contracted with hosts a wellness event, they usually call me to be a part of it. For short events like this one, they match my hourly counseling rate, which is nice! Alright, now onto the more truly “unconventional” income sources! My blog currently displays ads from two different networks: Gourmet Ads & Google Adsense. 1. Gourmet Ads ($29.95) – This month I made $29.95 in advertising revenue from Gourmet Ads. I currently display their ads in the sidebar of my site (which only shows up when visiting my site on a desktop, not mobile), in a small pop up on the bottom of my site, and sometimes, as video embedded within an article. It was pretty easy to get set up with Gourmet Ads, and now that it’s set up, I pretty much forget about it & it earns me some side cash for blogging, which I would gladly do for free anyways! 2. Google AdSense ($4.28) – Google Adsense is the other network I am enrolled with, and I display their ads in the header & side bar of my site. Clearly, this month my Gourmet Ads significantly out performed my Google ads, but hey, $4 is still better than $0! 1. Amazon ($3.15) – Any blogger can enroll as an Amazon affiliate and place affiliate links for Amazon products on their website. It’s super easy to set up, and as long as you disclose all affiliate links when you post them, it’s a great way to earn some extra passive income. With Amazon affiliate links, if someone clicks on your link & then purchases anything on Amazon within 24 hours (even if it’s an unrelated product from the one they clicked on on your site), you earn a small commission. And yes, I do mean small! Commission starts at 4% and increases slightly as you sell more product. This month, 3 people purchased books I linked to on my website, and I earned a few bucks in affiliate income. Okay, all of this is fine and dandy, but it really means nothing unless you know how many people were visiting my website. Users are unique visitors to your site. If the same person visits your site every day of the month, they still only count as one user. Sessions are unique visits to your site. So if the same person visited your site every day of the month, each visit would count as a session. Pageviews are the total views of pages on your site. If one person visits your site and clicks on a blog post, your About page, and your Resources page, that would count as 3 different pageviews, since they visited 3 pages on your site. Pages / Session is how many pages, on average, a visitor looks at on your site per visit to your site. Bounce Rate is the percentage of visitors who only visit one page on your site and then leave. A high bounce rate is really common on food blogs, since many people who visit are just looking for one specific recipe, then they are out! So, we can use this information to calculate how much money I earned in advertising per 1,000 visitors. To do this, you take your total ad revenue, and divide by the # of pageviews, then multiply by 1,000. This will give you your RPM (revenue per 1,000). This is actually a really good RPM! I’ve heard the average RPM can range anywhere from $2 to $25, depending on your traffic level & ad networks. *And yes, if you are an astute reader, you probably noticed that I fell pretty short of the 10k monthly pageviews required for Gourmet Ads. This is because I had applied with Gourmet Ads a few months prior, when I actually had reached 10k pageviews for the month, but I wasn’t able to maintain that traffic. It varies significantly depending on how many recipe features I have each month! 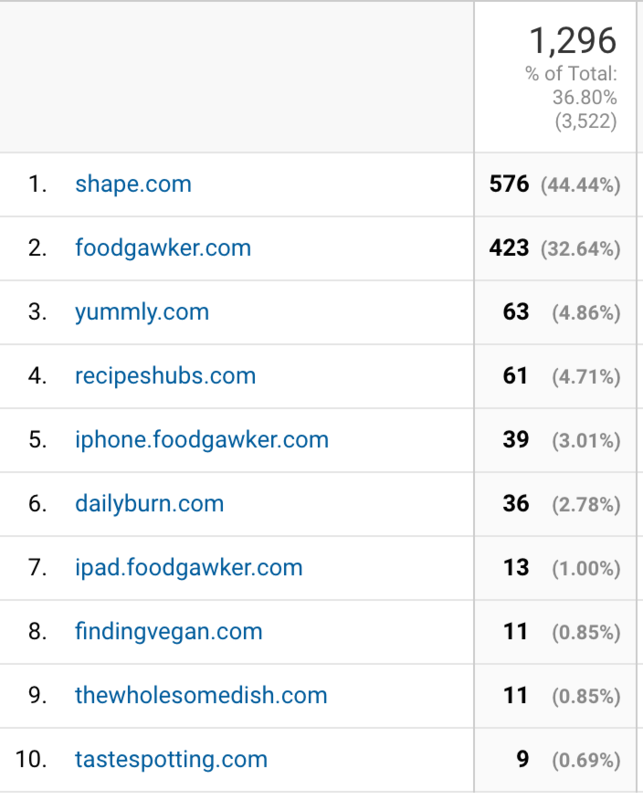 And please note: This is my blog traffic 1.5 years after casually blogging and posting recipes. I started in summer 2015 with less than 1,000 pageviews in my first month. Just be patient, produce quality content, and your traffic will slowly grow! 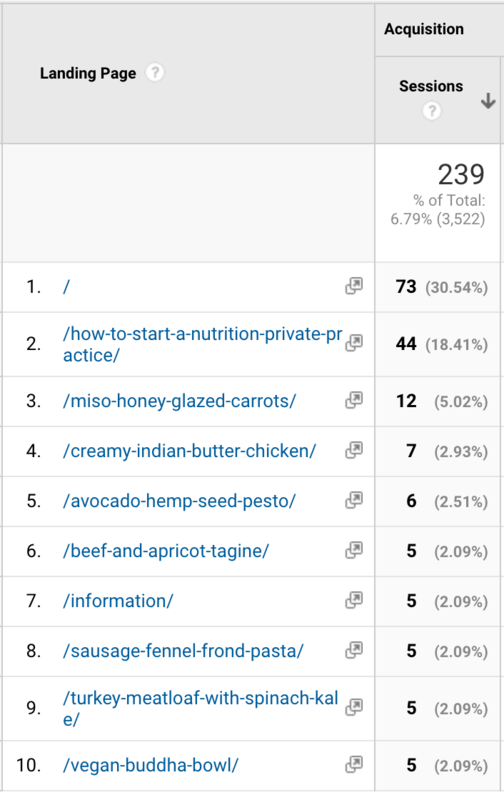 As you can see, I got the most traffic from referrals (when other websites link to your recipes), followed by social media posts, direct links (when people bookmark a page to return to it), organic search, and other (aka Yummly referrals). 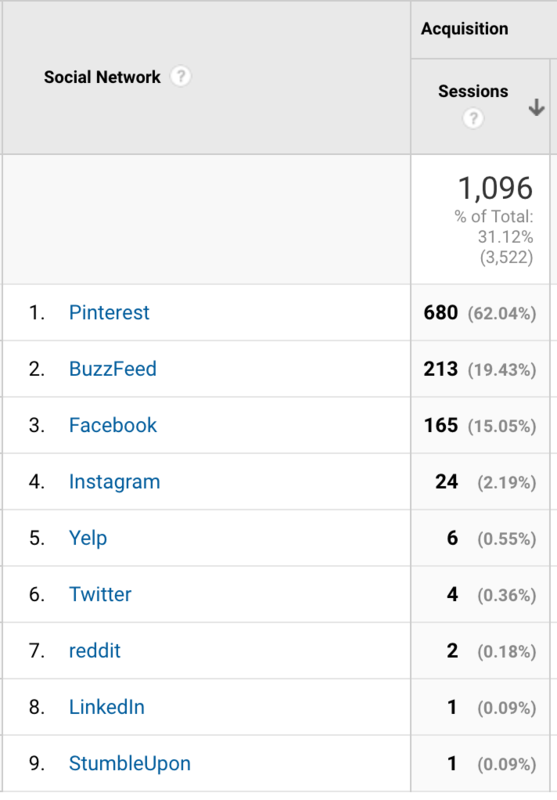 Like most bloggers, Pinterest is my best social media traffic driver. However, compared to most food bloggers, my Pinterest traffic is horribly low, so this is something I’ll be working on going forward! Just like with the referral traffic, my Vegan Buddha Bowl is the top performer on Pinterest as well, generating 196 clicks to my website in January. My 2nd best pin is for my article on Starting a Nutrition Private Practice, which drove 125 clicks to my site this month. It looks like my homepage is the #1 way people are finding me in Google, but my article on starting a nutrition private practice runs a close second! So, as you can see…. variety is really what drives blog traffic. You’ll probably have a few posts that consistently bring you traffic every month (like my Vegan Buddha Bowl & post about starting a private practice), but those other small trickles of traffic are what really add up over time! Just keep producing quality content, and eventually you’ll gain loyal readers and fans on social media. Blogging is definitely a long term game, but looking at the numbers each month & doing nerdy analyses like this one is super motivating for me, and I hope you find it helpful as well! So, what are my long term plans for 2017? As I mentioned before, my #1 goal is to continue to phase out any non-dietetic-related work I’m doing, without losing income. So in practical terms, this probably means increasing the # of 1:1 nutrition clients I am working with. For ericajulson.com, I hope to sharpen my niche even more and start blogging more about food sensitivities and other types of adverse food reactions. As a part of this, I’d like to connect with brands who make LEAP-friendly products & see if I can do any recipe development work for them. I also want to make a more focused effort at growing my social media following, and would like to create a passive income product of some kind to sell on my site by the end of 2017. I hope this income report was helpful as a real life glimpse into the realities of blogging. It’s a wild ride, but one I really really love! 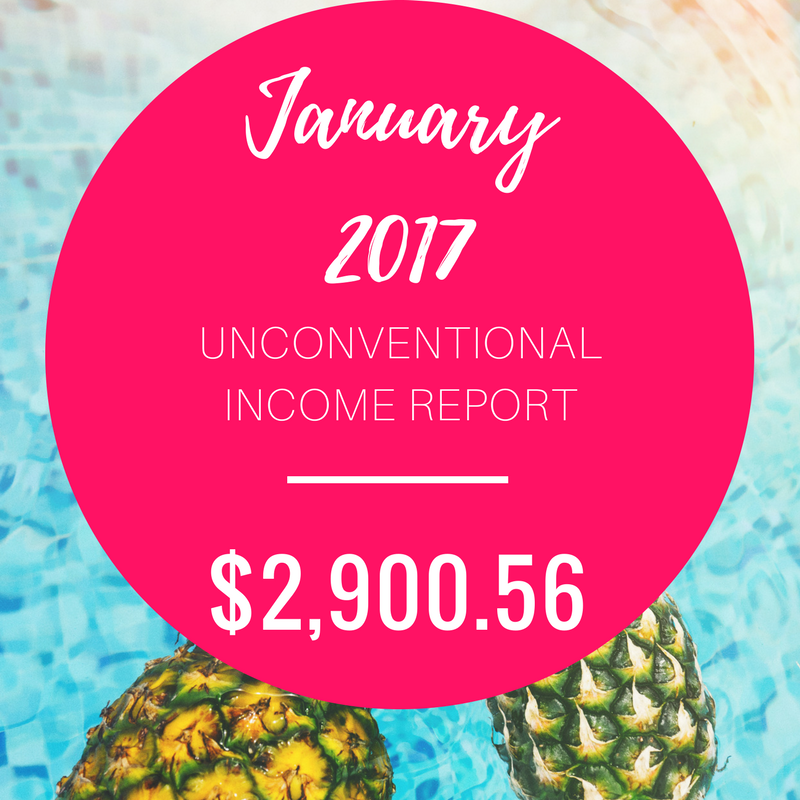 Stay tuned for more monthly unconventional income reports! Questions? Comments? Concerns? Leave a comment below & I’ll get back to you ASAP! Thanks for being so open! I’m wanting to start virtual counseling. Do you use a specific platform to do the virtual counseling, like Healthie? That’s what is holding me back. I just need to jump in, even if I don’t have all the pieces perfect yet! You know what, I don’t! I’m staying on a budget right now, so just doing good old fashioned paper & pencil method for notetaking. I also use Doxy.me for free & secure video chat, Fullscript for virtual supplement recommendations, and Square for charging people’s credit cards. As usual a great article- informative and resourceful.